“Team Building Activity” has a stigma attached to it that automatically causes your employees to roll their eyes. Yet it can be so important! 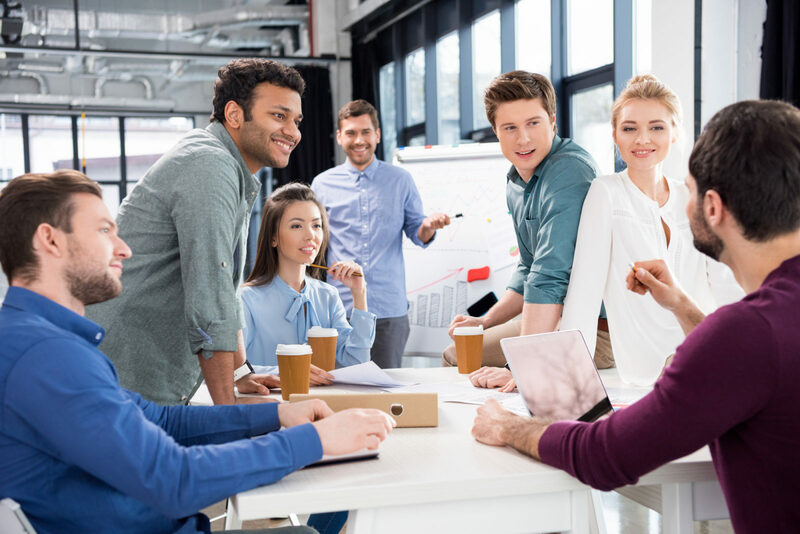 Whether you use the phrase or not, here are eight that your employees will actually enjoy (even if they do roll their eyes). Draw in 3D and have your team guess what you are drawing while competing against another teams! This is a great mash-up of old vs. new technology. Jimmy Fallon is even playing on The Tonight Show! Contact us for more info on getting it for your event here. This team building exercise is great because it requires no supplies. Have everyone stand in a circle facing each other, shoulder to shoulder. Ask everyone to put their right hand out and grab a random hand of someone across from them. Then have them repeat with their left and a different person across the circle. Now they have to untangle themselves without releasing their hands. If you only have one circle you can set a time limit they have to beat. If you have multiple circles the teams can race! Each circle should have a minimum of 8 people and probably no more than 16. You need at least five people for this one. Ask everyone to sit in a circle facing each other. Have each person come up with three facts about themselves, along with one thing that is a total lie. Suggest the lie should be realistic sounding to make the game challenging. Once everyone is ready, go around the circle as each person states their three facts and their lie in random order. After each person shares, the group guesses which one is the lie. This works especially well in teams that don’t know each other very well. Split your team into groups of three to five people, giving each group a raw egg. You also give each group a pile of random office supplies. Each group has 15 minutes to build a gadget that will protect the egg when dropped. After the time is up, you can drop each egg (along with its new armor) from as high as you can manage – always fun to go on the roof, assuming your insurance covers it. Office supplies can include tape, plastic utensils, napkins, newspapers, rubber bands, USB cables, etc. Just make sure each group gets identical supplies so it’s fair. Make a list of weird tasks for each team to do as a group. They could take a silly photo of themselves a local landmark, a selfie with a stranger, a photo in front of your competitor – you get the idea. First team to finish wins! This requires no extra supplies and can be done in less than an hour. Find the kid at heart in all your employees by stringing together multiple inflatables to make a giant competition! This will lead to trust and lots of laughter. You need blindfolds for most of your participants. After you’ve broken down into groups, blindfold all but one person in each. The person without the blindfold has to guide their team through an obstacle course. The team with the fastest time wins, or if there is just one team they can race the clock. For “obstacle courses,” you can easily build one with tables and chairs in your office. The blindfolded participants should be standing in a line, with each person’s hands on the shoulders of the person in front of them. The leader can not touch the team in any way. Team members can not let go of the person in front of them. Stop the clock when the last person crosses the finish line. Team with the fastest time wins! Hopefully, some of those team-building exercises will work for you! They also work well at family reunions, school functions, and other gatherings. Want more info like this? Sign up for our email list below – We promise, we don’t share it with anyone.